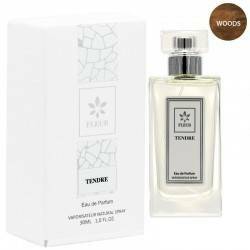 Tendre Men Perfumes Premium Woody and Intensive. “Tendre” tells a story of the mythic elements of the ancient and natural world. Mineral notes give root to woody tones and warm resins flow behind rich green notes and clear dewy water to bloom into the air with the vivacity and sparkle of citrus scents. Experience this bold and ancient alchemy.